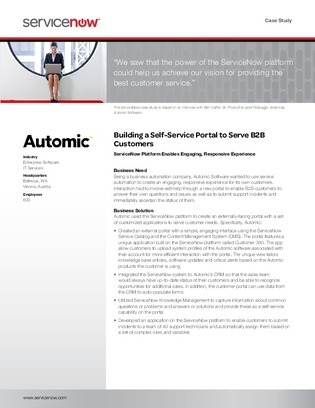 In this case study, Automic Software, a business automation company, wanted to use service automation to create an engaging, responsive experience for its own customers. Interaction had to involve self-help through a new portal to enable B2B customers to answer their own questions and issues as well as to submit support incidents and immediately ascertain the status of them. Read on to learn how Automic Software was able to achieve these goals, improve their customer service and see increased productivity from their technical support team.